The eleven followers went to Galilee. They went to the mountain where Jesus told them to go. On the mountain the followers saw Jesus. They worshiped him. But some of the followers did not believe that it was really Jesus. Eleven followers. Wow, what a vivid reminder of the failure they had been — it was so bad that even one of them was dead at his own hands. Eleven was so much less than twelve. Twelve was such a special number for God's people. But now there were eleven. Despite Jesus' victory, it was a reminder of the fragility without him. Next, notice they obeyed. They went to the mountain where Jesus had told them to go. They did what Jesus asked them to do. 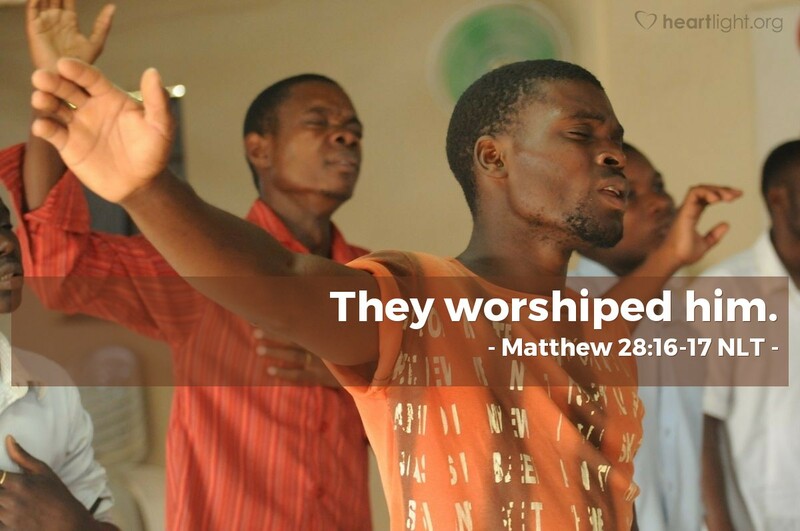 When they saw Jesus, they worshiped him. But even then, after the resurrection appearances and the testimony of those who had seen him, there were still some doubters: it was hard to believe it was really Jesus after all they had been through; it was almost too good to be true. The resurrection of Jesus IS almost too good to be true. It is definitely outside our experience and expectation. But the turnaround made by this wounded and incomplete group of eleven failures testifies that this encounter with Jesus after his resurrection changed them forever. Jesus' resurrection and command give them a sense of purpose, certainty, hope, and destiny that they had not enjoyed even before the Cross. And now, now they can trust he will go with them. So the fitting primary response to Jesus' triumph over death is to worship him. As we worship him, we too can be reawakened to the purpose and hope he gives us, because as we worship him, he is not only the object of our worship, but he is also the Lord who is present and will go with us every step of the way. - the family members who share my love for Jesus and trust in his saving death and resurrection will never be parted from Jesus and our relationship with Christ will never be broken. I praise and thank you for giving me this victory at such an awesome cost to you. In Jesus' name. Amen.